So here we are at the finale of the gingham dress challenge. Hallelujah! I can hear you all shouting. 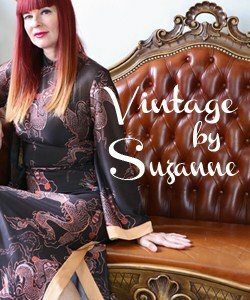 When I originally spotted this dress I knew it was full of creative styling opportunities. Gingham lends itself to many combinations. The fact that this dress is black and white makes it extra versatile. Outfit #4 from this post which you can’t see in the photo. 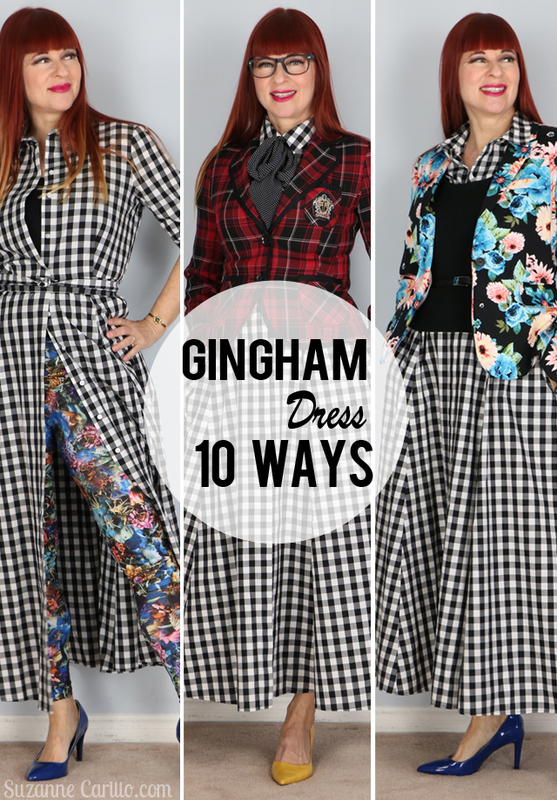 That puts us at outfit #11 today of 13 ways to style a gingham dress. Belts and jackets are an easy way to add some panache to a dress. 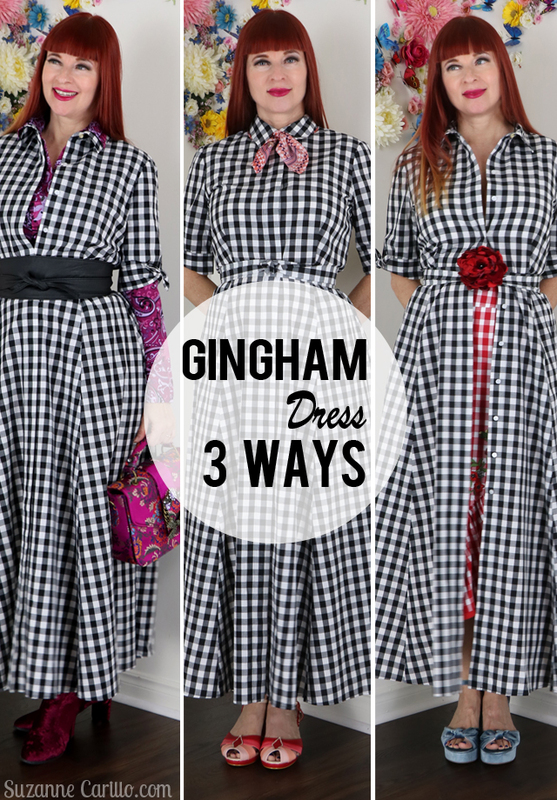 Outfit #12 of 13 ways to style a gingham dress. Wearing the dress as a duster/coat. That is the brilliant thing about button up dresses, you can wear them like a jacket. Aren’t those pants groovy? You’ll be seeing more of those soon as they are my favourite right now. 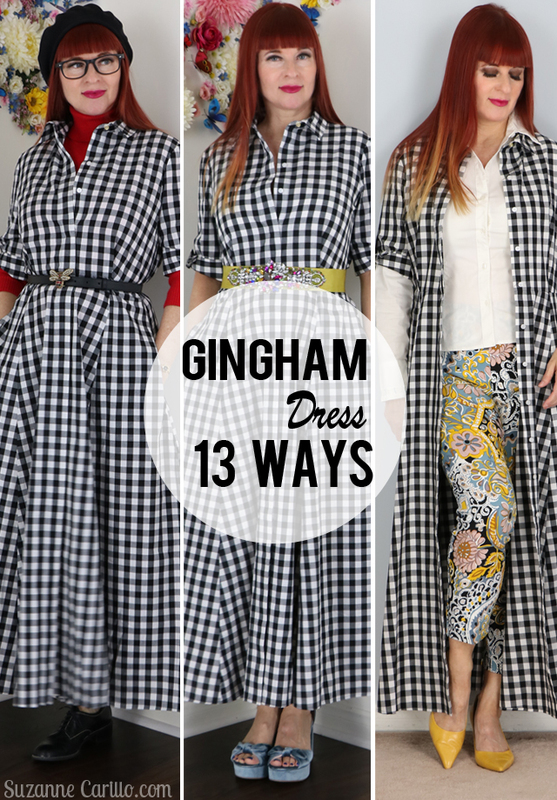 Outfit #13 of 13 ways to style a gingham dress. Layering a thrifted red turtleneck sweater underneath with my Gucci belt and some vintage shoes. 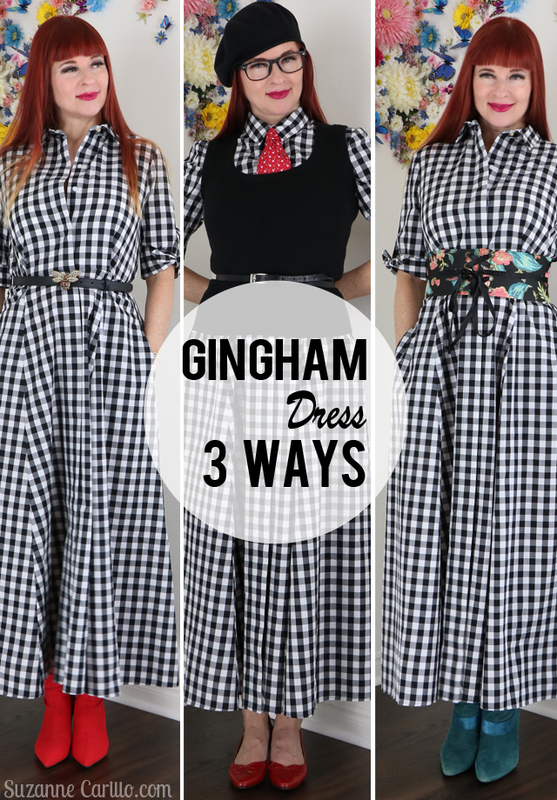 So there you have some of the options I came up with for styling a gingham dress 13 different ways. 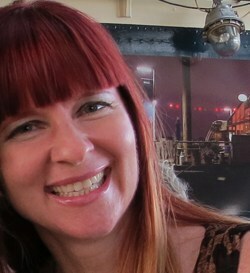 And yes…I’m keeping the dress! The duster idea, has been one of my faves ever since seeing it a couple of years back (on someone who I can’t remember)—it creates a whole different look, and is so smart for traveling!! Those pants were also a recent retail purchase so they won’t be going in the shop. Sorry! I love that dress no matter which way you style it. But I’ m really liking those yellow print pants with it. Aren’t they fun? When I saw them I knew immediately they’d work with the dress. Ha ha! Don’t give me nightmares Vix! This was already boring me to death by the end. I still love the dress but it felt like I’d worn it for a month straight. All of these looks say “Suzanne” to me, but my favorite has to be the dress worn as duster. 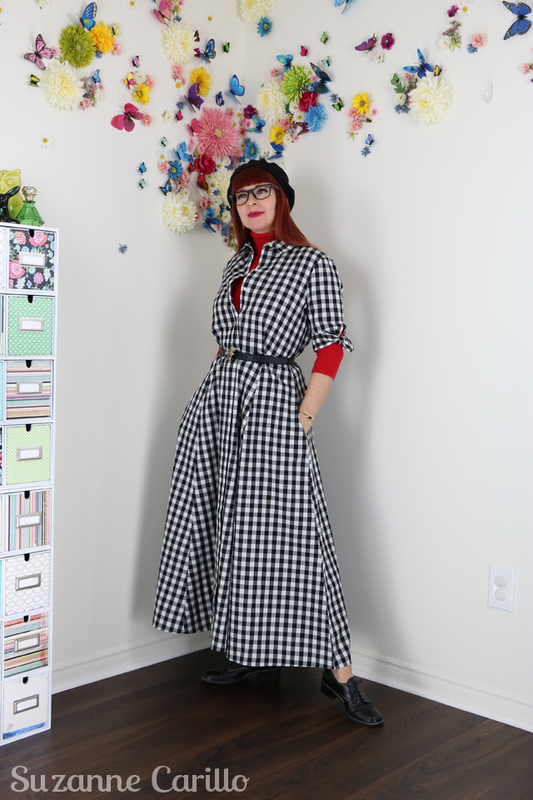 Not only do I like doing that myself for button-down dresses, but THOSE PANTS!!! They rock. Can’t wait to hear more about them. Oops…my bad. Yes! I’m keeping this dress. After all this I’d be crazy not to. Drooling over outfit iteration number 12 ! 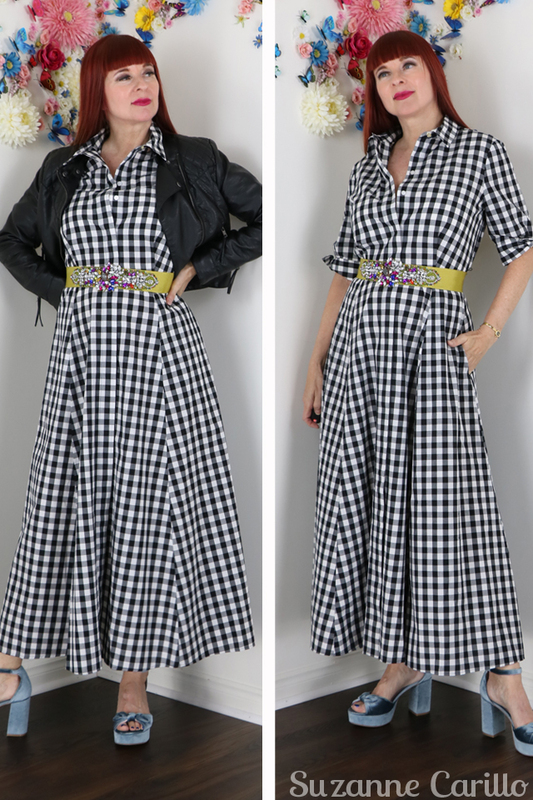 Gingham dress as duster over that fab yellow print pants, takes the cake. ah mazing !! Do you eat a lot of tofu? What do you mean by tiny? I do eat tofu. Not tons, but I eat it about once or twice a week. You give us so many good ideas. Your creativity is a super-power! 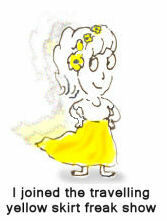 woww, these posts have been so brilliant and inspiring!, and I’ve enjoyed all of them!. So many good ideas!. And now you share even more fabulousness, and three new outfits! I think that I would pick number 12 as a fav, the dress worn as a duster over those groovy pants. I do love the fab layering, and yellow shoes are perfect!. Lots of possibilities! I love a button-up dress, I’m so happy that they’re in all the shops this year! I think my favourite has to be with the red and black tartan jacket over the top. Finally… she gives us the verdict: she is keeping the dress. I should certainly hope so. Outfit 12 is a really good one too.